I feel like a horrible mother. Need chizuk. I feel like the worst mother in the world. I have a few little kids at home and I try to be a good mother but at the same time I feel like I'm horrible. I try to give them everything yet at the same time be firm with certain things to show them stability and that they can depend on me. But those time when I snap all I want to do is die. I literally cry that I'm ruining them and messing them up for the rest of their lives. All I want is them to be happy and healthy and I know they are kids but sometimes after the 3rd spill I just snap. I'm so scared that I'm ruining them. I love them so much and they are so amazing. I have so much inside about this it's insane. I was just crying as I looked at some baby pictures bec they were so perfect and now I'm messing them up. First of all, do you give them love at other times? The #1 thing you don't want is to have them grow up devoid of emotion. And as long as you give the good emotions more than not, you're ok. Kids understand and need discipline, and it simply doesn't mean you're snapping! Is there any way you could alleviate the need to 'snap'? Do you have help? Hugs. Mothering is hard. It will push every button and get on your very last nerve. What I have found to be helpful over the years is to prepare mentally for the trying situations that are inevitable, that will come up again and again and give me ample opportunity to get them right. At the end of each day (and sometimes in the middle, if I get stuck) I mentally review the situations that I wish I had handled better and imagine myself responding the way I want to next time. Then when it happens, I not only have a script but a vision for how I want to respond. You really do get better at this over time. I was a pretty impatient young mother, and I'm sure my older ones suffered some from this when they were little, but over time you can fix this. I don't think they're messed up for life. After food clothing and shelter, the biggest need is confident parents. You are absolutely right that you are messing up. Your method of messing up is not being confident. Do not do that thing. Take a few deep breaths and decide that you are a fine mother and you know the story and you know what's best. First of all, you probably do. Second of all, it doesn't matter if you don't. The kids don't need you to be good at it. They need you to be absolutely sure, within yourself, that you are good at it. Nobody since Chava has known any more about it than you do. Confidence is the fourth food. Do that thing. Build it inside and use it. THEN you will know you are doing fine. First of all, you probably ARE doing fine. Lie on the floor, let them climb all over you, use your hands to pull them apart when they fight, don't give them philosophy lectures. Smile a lot and don't get upset much. The reason is: one day one of them may actually do or be about to do, something really bad. You will yell. But if, at that time, your yells mean nothing, because you have yelled about every little thing, you will not be able to save the kid. Do not waste your ammunition. You only have so much. Oh, and don't pick up a baby with a tense hand. Let your voice reach the baby one micro second before your hand reaches him. Take a deep breath and limp your hands before touching a child. Have pacifyers. Lots of them. Dirt is good for them. When you wipe their little faces, use a soft clean sponge and a gentle touch. The mouth is the one of the portals to the soul. There is no perfect Spring, there is no perfect rose, there is no perfect mother and there is no perfect childhood. Perfection is in Shemayim and in mathematics. You do not have to be a perfect mother. There isn't any such thing. OP, DID I JUST WRITE THAT POST??? This is me! I can't believe it. One thing I can tell you. As I got older, I stopped crying about it. I stopped taking it so to heart. I realized that I'm doing my best and more than that is beyond my capability. I started feeling better about myself. I realized that every mother is consumed by guilt. Hardly a mother can say she's the best mom around. Except if her kids are her ONLY priority in life. But for me, I have more priorities. Of course my children are from the top ones. But I do have a husband to tend to. I have a home to keep clean. I have meals to cook. I have important shopping to do. I have appointments to attend. And so I cannot always be the calm, well rested, and sensible mom. And I'm finally learning that it's ok! Op, I hope you learn that too. Kids are very resilient, chances are that you are not messing them up. Unless maybe you are beating them with shoes or calling them horrible names or something like that. Occasional yelling mommy is not going to ruin them for life or scar them. It's probably better for both of you if you learn some better coping skills, but please stop feeling guilty. Chazak Ubaruch. Very inspiring words. One thing I do feel strongly about is always apologizing. First of all I feel I owe it to them - you can't lose it at a kid and then pretend nothing happened, that's not the way relationships are built. Secondly, I think it adds more to the motivation to do better next time than just wallowing in guilt does. When you apologize to your child whom you love, and tell them you made a mistake and did not mean to do that, and will do your best not to let it happen again, and they are trusting you on that, it just has a stronger lasting effect IMO. I also think that it might help to relax somewhat about "giving them everything." You can't, you shouldn't, and it will only stress you out and make you more snappy. When you accept that and work on your kids accepting it, you will probably all be calmer. Of course you want your kids to be happy and healthy, but even the happiest among us had our tantrums when we were kids - if your kid is crying that does not mean you are failing at the happy kid project. This is a key point for me - the frustration of my kids' demands and kvetching is often what triggers me snapping. So I decided there is NO MORE giving in to kvetches, period - now, this is something I decided in the past as well, but these things take lots of maintenance and somehow I'd slipped into what could be seen as momentary convenience at the expense of long-term hassle and bad chinuch. So now we are averaging one tantrum per day for the last three days but I think my 3-year-old is getting the message, and I am snapping MUCH LESS because instead of engaging in negotiations and whatnot with a whining little child (doomed to frustration) I lay down my rule and then accept that there will be crying but it is a fine healthy tantrum and will pass. Boy do I get a headache until it does, but each time this happened it did pass and the day continued very pleasantly and lovingly and - here's the important part - with no guilty mother complex causing me to be vulnerable and irritable and snappish. I can only hope and pray she won't be wounded for life, and I'm trying to make up for it with extra showers of positivity when things are going well, but I think history and logic are on my side here. I don't think anything's gained when the mother drives herself crazy trying to cater to kids' constant whims in the effort to keep them happy. Not saying you were doing any of that, just sharing my own journey of the last few days. I have yet to see any kids happily and safely to adulthood, so you can take me with a grain of salt if you wish. It's also so nice to see that others have been in my shoes and know the feeling. The guilt is so overwhelming. If I had nothing to do I could probably sit and cry over it for hours and hours but I don't have that time even but the times I do cry feel like eternity. Thank you for letting me vent. And for all the amazing advice. It really relaxed me tonight. Oh yeah one and a half is tough. For some reason I thought you were talking about older kids. But I get stuck with my 1 1/2 year old, on one hand she seems like too much of a baby still to say no to her but on the other hand her demands wear me down until I want to... never mind we're in public here Well, she is going to have to learn to deal with disappointment too, I guess. But the tantrums are fierce, I don't remember my other one being this intense at this age (maybe that's why we're going through tantrums now at 3 so much...) and she really seems to not quite understand why no one wants to give her what she wants... which is why I am nursing her again right now. I dont know, but I don't think guilt is so bad if it motivates you to be a better mother. Little kids spill things, they dont do it on purpose, and they dont deserve to get yelled at for it. If it happens once in a while, ok, but if kids are getting yelled at on a regular basis, then maybe you should be looking into parenting classes of some sort. I have a few little ones but that's my youngest and probably the most spoiled bec it's just convenient to shove a pacifier in to stop the crying or give him cereal to eat when he refuses dinner. And it's not that I always yell over spills, I try to remind myself they aren't doing it on purpose but sometimes it gets to me but the spills was just an example of something small they might do that is so small but is the straw that breaks the camels back. Post above was me - op. I didn't read the other responses but I just wanted to say that I know I make bad decision regarding my kids everyday. I am not a perfect human and I am certainly not a perfect mother. I don't think it makes me horrible and I don't think my kids will be in therapy for their entire lives because I didn't make the best parenting decision I could have made. So please don't think being a imperfect mother equals being a horrible mother. Try every day to be a little better than the day before. As long as your kids aren't neglected or abused they will be OK.
And I thought this fit this thread so I'm including it...lol. One of my biggest points against most parenting classes is that they set you up to feel like a failure. Now before all of you who believe in them start throwing tomatoes, let me clarify that I think many of the tips and techniques they offer can be helpful. 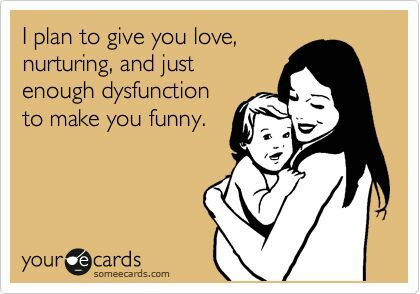 And of course, for someone who grew up with dysfunctional parents it is important for them to learn more about parenting. BUT, over time I have learnt that the number one thing that gets in the way of my parenting is GUILT. All of those voices second guessing my decisions and condemning my actions since they are not always "according to the books" or the experts say they will "ruin my kids for life". What kids need most is parents who feel good about THEMSELVES. Parents who acknowledge that they are HUMAN, will keep making mistakes and can then move on. For me personally, these concepts have been a lifesaver. and here I am thinking wow I must have awesome kids I never feel so overwhelmed by their kvetching and messes. then I read your next post. about not giving in to cereal or a pacifier. oh. why wouldnt you give in to that? a paci calms my son of course I let him have it. hes two/three. still a baby in my books. If they do not like supper then right before bed I serve cereal while reading a bedtime story. do I want them in and out for the next hour cuz theyre hungry? I guess im just more relaxed. I do not feel guilty about these things I feel like they are good systems in place to help our family run smoothly. crying over your parenting seems quite over the top to me. I could only see myself doing thamessest if I really lost it at them. like really.otherwise you made a mistake go over to your kid and say "sweety remember when you spilled the bottle of milk? mommy got upset that was a big mess mommy does not like messes. next time ask mommy if you need a drink. mommy was upset but she still loves you okay" big hug. I dont believe you need to apologize. mothers can raise their tone a little and show theyare displeased. not yell. not name call or rant. "oh my this is a huge mess! chaim I am not happy, you are not allowed to take milk by yourself! go sit on couch and take a time out!" nothing to apologize for in my opinion. I hesitated responding at first because I thought my post might come out harsh, but I feel like it needs to be said. the daily stress of raising a family and running a house can be completely overwhelming. it is normal for a mother to loose her cool and yell at her kids over trivial things, such as spills or kvetching. but that doesn't mean it is okay. every time you yell at your children, their heart breaks a little bit. preschool age and older kids sometimes NEED stronger discipline than redirecting, and yelling at them at that point shouldn't break them (although it should not happen often, and should still be loving, no name calling or putting down.) but a toddler? a one and half year old? this baby should not be yelled at ever. a toddler who takes the paci and eats cereal at night is not spoiled. he is loved and cared for. who made these rules of what times cereal is okay to eat, anyway? a toddler who spills is just enjoying his drink. he should not have his mother looser her temper over this. or over anything, really. I really suggest you set your mind to stop loosing control. read some books, take a course, learn some techniques for anger management and for frustration tolerance. mostly, though, and I can say this from experience, it is a mindset. when you expect and accept kids to be messy and not perfectly behaved, you don't lose your patience as much. and as a previous poster said, it is also a good idea to loosen your ideas of what a child should be doing, so you don't get upset as often. instead of crying over it and feeling guilty, use that energy to strengthen yourself not to do it again next time. So right. Listen to Black Sheep. I couldn't figure out what was so bad about cereal and a pacifier. 18 months isn't 28 months, not by a long shot. 18 months is bigger baby, not toddler. Always remember what is important and what isn't. It is very intellectually challenging to be doing that all the time. What is important is what threatens life and limb and propriety. Mere inconvenience doesn't matter. Oh, it is so hard. I remember. Hugs. I don't know which classes you're referring to but Dina Friedman keeps on stressing that you are NOT messing up your kids for life if you made a mistake or if you feel you raised them wrong up until now. You are merely challenging them. She says this over and over. It's ok to mess up it's ok to make mistakes. You are not ruining them. op, I know how you feel. After I loose my patience and scream I feel so, so bad and sad for my kids. I have a 1 1/2 yr old - that is not my challenge with parenting at all. My challenge is my 9 yr old son. I can write pages on him. The pressure he creates in my home affects how I am with the other children. I feel so frustrated with him that he pushes all buttons till I bust. I feel so sad for him since obviously he is not happy. I am worried for him and the other children how they will turn out as young adults since I am not dealing properly with the stress the 9 yr old causes. My children will not eat cereal for breakfast. Fine. I offer crackers, cookies even cake and milk sometimes. Anything to avoid a fight in the morning and get them off with food in their stomachs. I pick my battles and breakfast is not one of them. I am telling you the following story to A) get it off my chest and B) to show you that you are not alone. "I hope a new boy returns home today who acts better". But I even though I tried to stay calm throughout the whole thing, I yelled like a maniac right before he left. Has I not, he would have missed his bus. He basically left to run from my wrath. And of course, I feel like a bad mother since I yelled like that. Some days are so hard. I live in lakewood and have spoken to many people. I have also taken pareing classes. But I am not in a good place now. If anyone can recommend someone I can speak with that would be so helpful.. Sorry, op for hijacking. I hope we both get the chizzuk we need and are both successful raising our children.